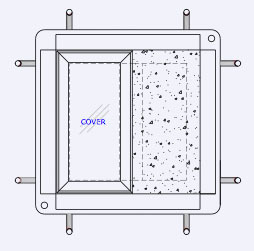 The APL unit is designed for areas that have limited available access area but requires the need for a larger pit. The first half utilizes our standard Model ADL frame with your choice of cover type, the balance of the unit is tied in with the poured floor. Selecting the overall unit size needed using either the mension information chart of the Model ADL section 2-2 or the Model POL section 3-2. Selecting the aluminum frame size needed for the cessible side from Model RCF section 5-2.